We are fortunate to have friends living in Barcelona. While visiting them we often enjoy some lovely and wines from Rioja, a Spanish wine region known for its big red wines. 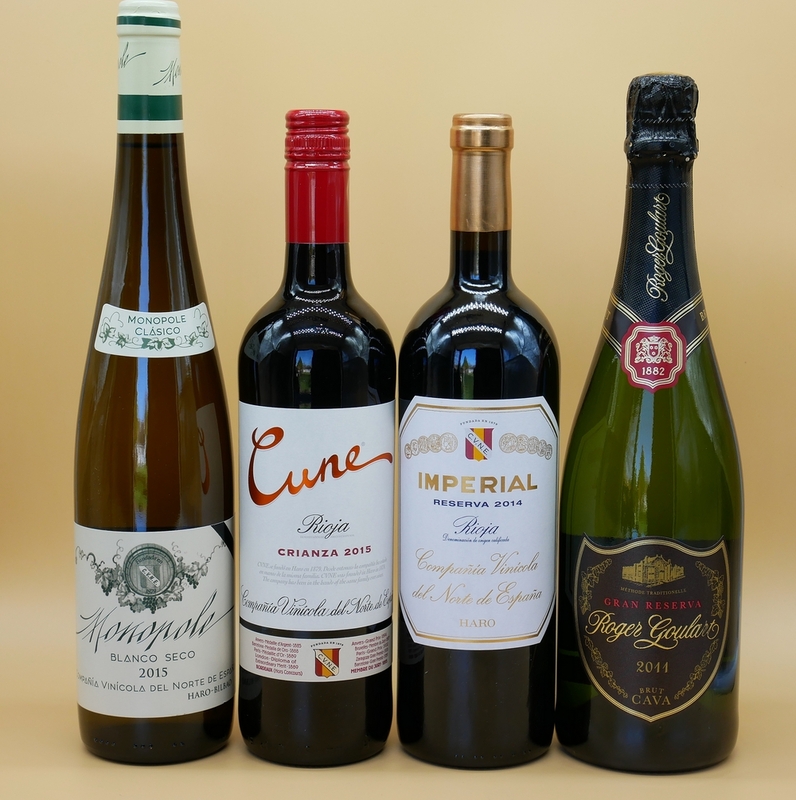 It’s not all about the reds though so we were delighted to be sent a range of wines from CVNE to sample and to create some food pairings. CVNE stands for La Compañía Vinícola del Norte de España – The Northern Spanish Wine Company. 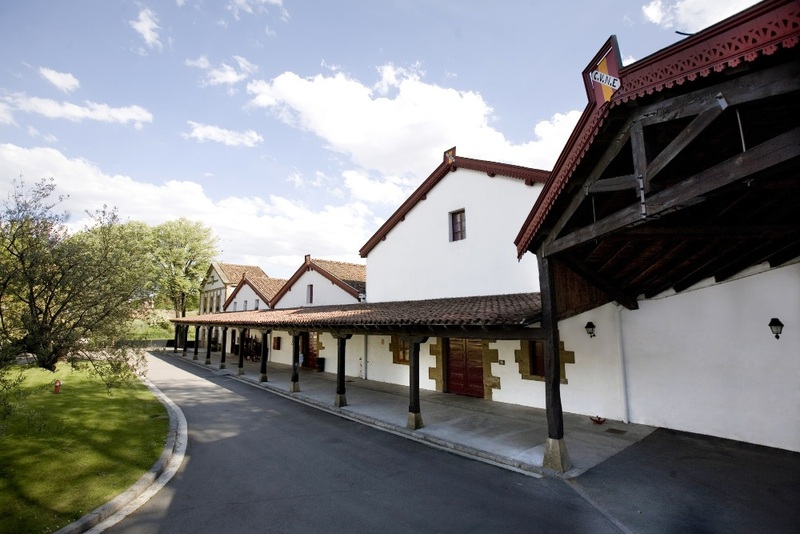 It is a family run company founded by Eusebio and Raimundo Real de Asúa in March 1879 in Haro, Rioja. It’s rather lovely to learn that the company is still controlled by the same family some 5 generations down the line. C.V.N.E. 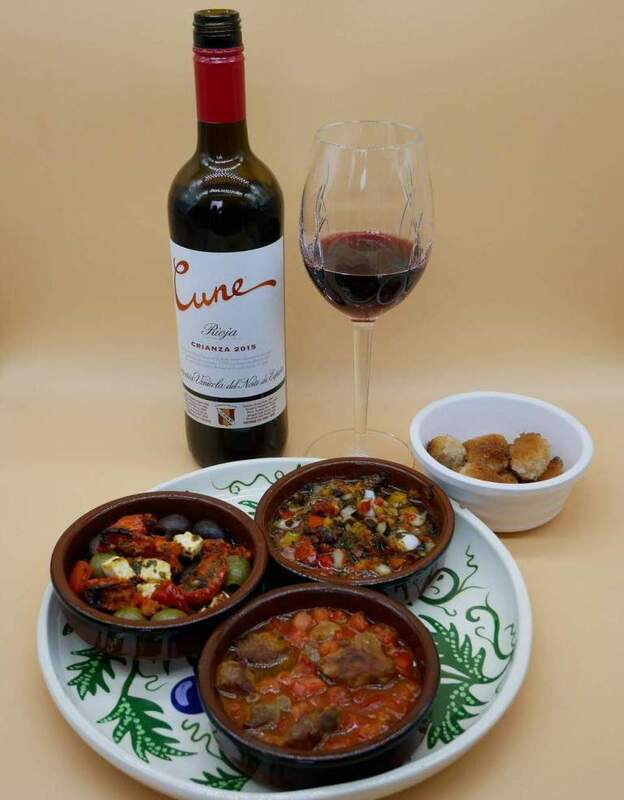 is comprised of three wineries in Rioja: Cune, Viña Real and Contino. They have recently purchased the renowned Catalonia winery Roger Goulart, dating back to 1882, located in the world-famous D.O. Cava region. The latest acquisition is the Virgen de Galir winery located in the premium D.O Valdeorras in Galicia. The Technical Director of the company is a woman, Maria Larrea Quemada, who was born and raised in Rioja. She studied Vine-growing and Enology at university, first in Madrid, and later on in Montpellier and Bordeaux. 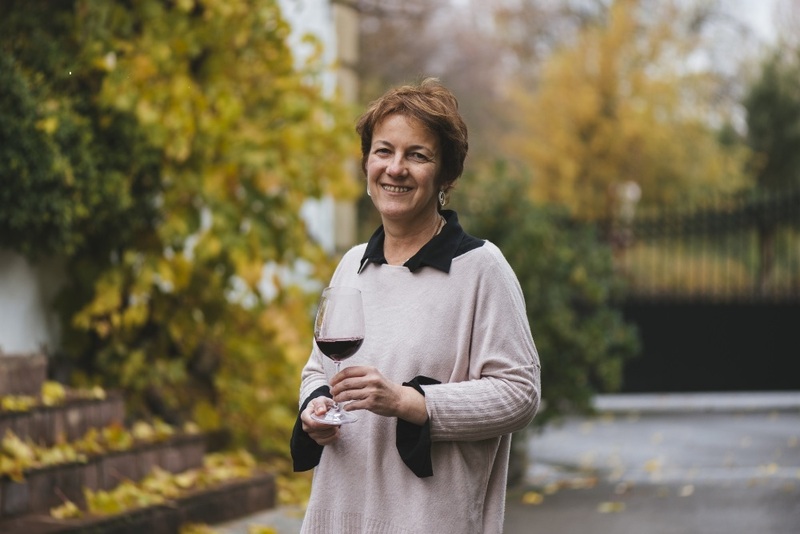 Her first harvest once back in Rioja was for CVNE, and after gathering further experience in other wineries in Rioja, Mancha and Navarra, she returned to CVNE in 1991 where she has remained as Technical Director. The first of the wines we tasted was a Roger Goulart 2011. This is a rather refined Cava, which I really loved. On an unseasonably beautiful day in February, we were able to sip this in the garden. The light shone through it, showing off its golden highlights to perfection. On the nose, we detected peaches, apples and a little yeast. It was full and creamy on the palate, and we accompanied this with a plate of Loch Fyne oysters served simply with a squeeze of lemon. 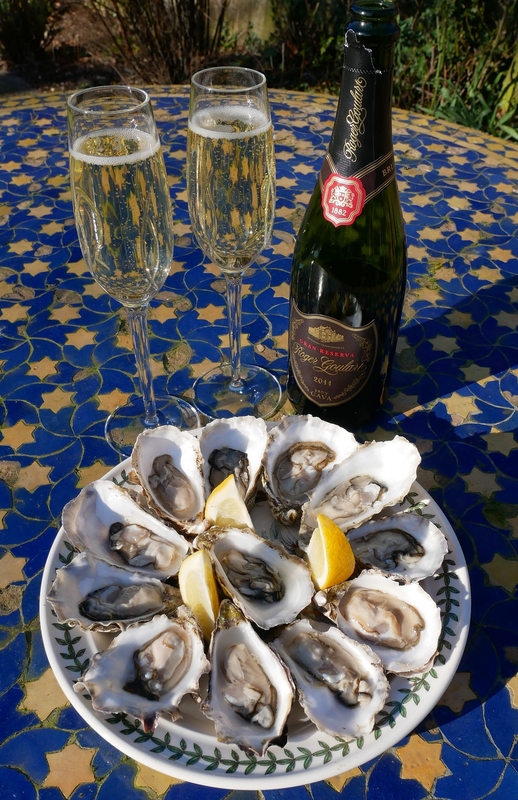 The acidity of the cava and long finish worked well with the salty oysters and the zingy lemon juice. 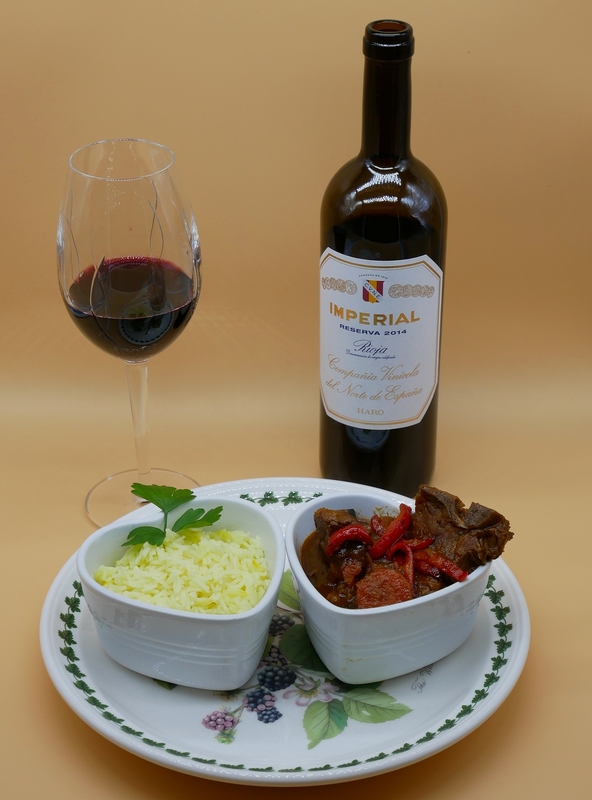 I’d had the foresight to start the slow-cooked mutton dish that I planned to serve with the 2014 Imperial Reserva before sitting in the sunshine with the Cava. It’s no secret that I’m a bit of a fan of Omar Allibhoy, so I slightly adapted his recipe for Spanish lamb stew with olives and dried apricots. I added some sautéed red peppers at the end for a pop of colour. I thought that this could make for an easy fuss-free Easter dinner, with the apricots it had a hint of Moroccan cuisine. Slow cooked mutton adapted from an Omar Allibhoy recipe. Put the flour and some seasoning into a large bowl. Tip in the meat and ensure that it's well-coated. Pour the olive oil into a heavy based pan, heat, add the mutton and brown on both sides. You may need to do this in several batches. Place the browned meat into your slow cooker pot. Add more olive oil to the pan if necessary. Add the onions and carrots to the pan. Cook until caramelised and golden brown. This may take 15 minutes or so. Add the spices, tomato puree, apricots, olives and honey. Stir for 5 minutes. Place into your slow cooker on Low along with the lamb stock and some seasoning. Allow it to cook for around 6 hours until the mutton is tender. Transfer to a large saucepan and heat gently so that the stew thickens. Serve with saffron rice or crusty bread to mop up the rich sauce. This could be made in a casserole pot on a low heat in the oven. You would need to reduce the cooking time to around 2-3 hours - it's ready when the meat falls away from the bone. The Imperial Reserva Rioja is made from a blend of grapes from CVNEs’ vineyards in Rioja; 85% Tempranillo, 15% Graciano, Mazuelo and Garnacha. A deep garnet red with a hint of blue at the rim, it smelt of ripe dark berries with a hint of liquorice and a little tobacco. It was complex on the palate with a long velvety finish. It went incredibly well with the flavoursome mutton stew with its hint of sweetness from the apricots. For a simple midweek supper, I oven baked some potato slices with rosemary, trout fillets with thyme, and served with a crème fraiche horseradish and chopped walnut sauce. We had this with the 2015 Monopole, made from hand-harvested viura grapes which are gently pressed, and then fermented in stainless steel tanks. After fermentation, the wine ages on its lees in used 300- and 500-litre sherry butts. It is then rather unusually blended with sherry, and it is aged around a year before bottling. 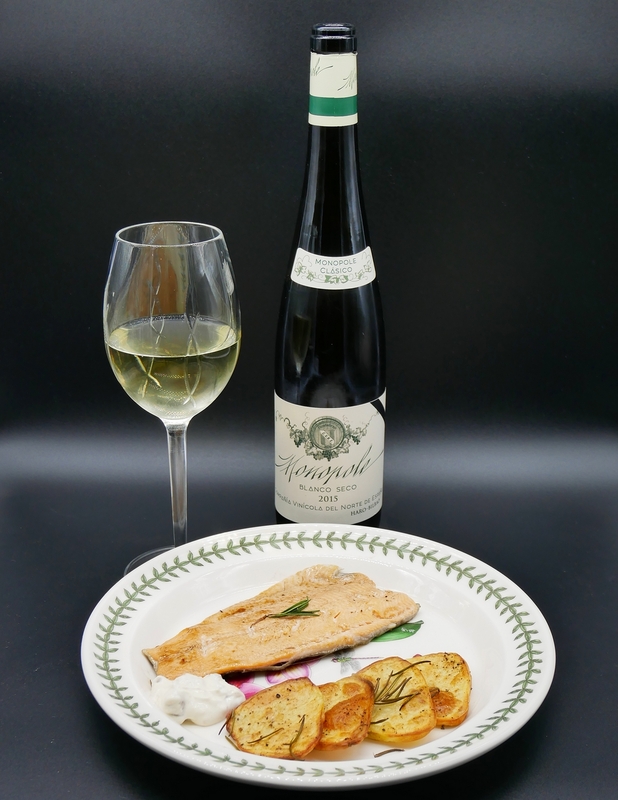 I loved this complex wine, bone dry with a mineral finish, it worked really nicely with the delicate fish and herbed potatoes. Finally, on a March day when it hailed, I wanted to be reminded of the Spanish sunshine and made some Spanish Tapas. Who doesn’t love these little tasty dishes to enjoy with a glass of wine? In this case, the CVNE wine was the perfect wine to go with mini croquettas, baked olives, squid, and pork in a rich tomato sauce. The Cune, a Crianza from the 2015 vintage, had a lovely cherry-red appearance with light summer fruits coming through on the nose. This had undergone a period of one year in oak, giving little hints of vanilla amongst those gorgeous fruity cherry notes. A real treat, with a long and elegant finish. I think this would also match nicely with some Parma ham, served simply with crusty bread. Disclaimer: We were sent the wine to review by CVNE wines. All views are our own. Sounds fabulous Sarah! Iook forward to trying this one!